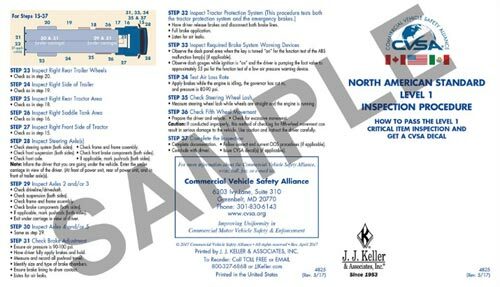 Use this Pocket CVSA Inspection Chart for Tractor-Trailers 4825/55-FBT wall chart to train employees on the Commercial Vehicle Safety Alliance (CVSA) vehicle inspection criteria for tractor-trailers. Each chart covers the 27 steps for tractor-trailers for a Level 1 Critical Item Inspection that must be passed to earn a CVSA Decal. This pocket CVSA chart is folded, printed full-color on tagboard. Can be carried or kept with the vehicle.